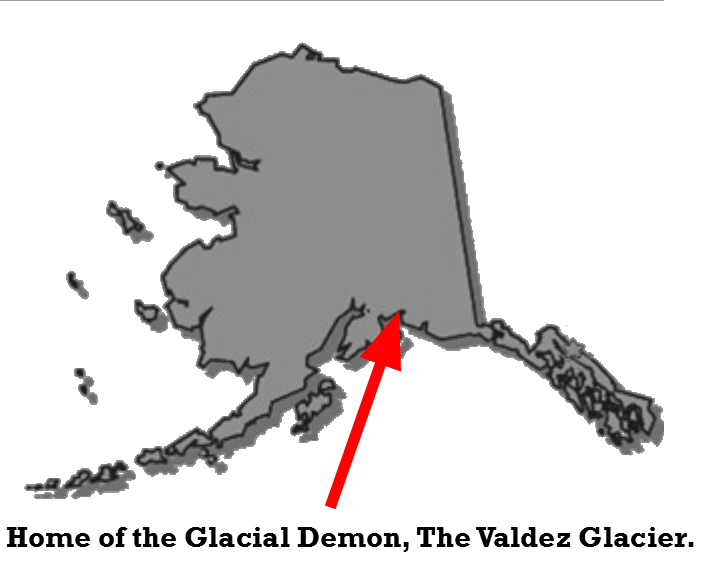 Mysterious wild men are frequently mentioned in Alaska’s history and many locations have their own legends regardless of the native or non-native human population inhabiting the area. Valdez is no exception to this. Captain W.R. Abercrombie, Second US Infantry, was sent to Alaska during the Klondike Gold Rush of 1898-1899 and ordered to explore Valdez and the Copper River Area and to then report his findings to the War Department. During this time, many prospectors elected to travel to the Dawson area via the port of Valdez, Alaska. This is not unusual in itself because miners from all over the globe attempted access to the Klondike through many different routes. I noticed in talking to these people that over seventy per cent of them were more or less mentally deranged. My attention was first directed to this fact by their reference to a “glacial demon”. One big, rawboned Swede, in particular, described to me how this demon had strangled his son on the glacier, his story being that he had just started from Twelve-Mile Plant (a small collection of huts just across the Coast Range of Mountains from Valdez) with his son to go to the coast in company with some other prospectors. When halfway up the summit of the glacier, his son, who was ahead of him hauling a sled, while he was behind pushing, called to him, saying that the demon had attacked him and had his arms around his neck. The father ran to the son’s assistance, but as he described it, his son being very strong, soon drove the demon away and they passed on their way up toward the summit of Valdez Glacier. The weather was very cold and the wind blowing very hard, so that it made traveling very difficult in passing over the ice between the huge crevasses through which it was necessary to pick their way to gain the summit. While in the thickest of these crevasses, the demon again appeared. He was said to be a small, heavy-built man and very active. He again sprang on the son’s shoulders, this time with such a grasp that, although the father did all he could to release him, the demon finally strangled the son to death. The old man then put the son on a sled and brought him down to Twelve-Mile camp, where the other prospectors helped bury him. Created by author from public domain image, 2016. 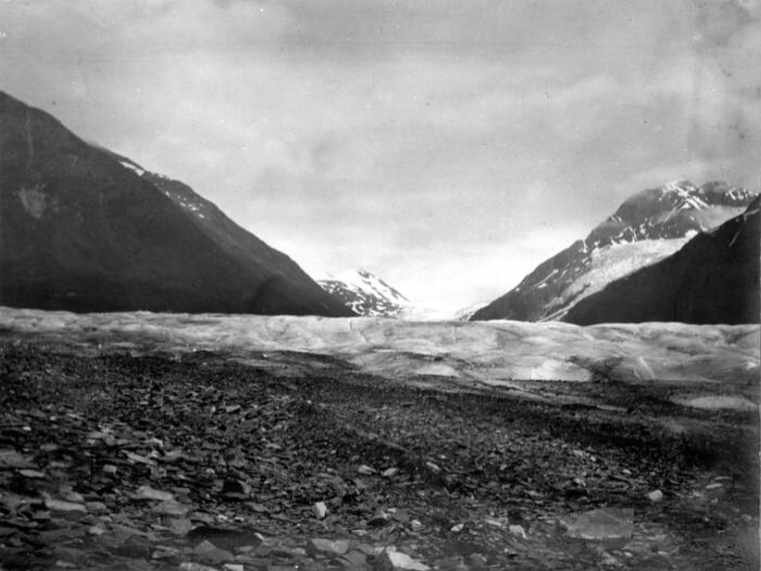 Looking up the Valdez Glacier, 1905. US Geological Survey, Public Domain. During the recital of this tale the old man’s eyes would blaze and he would go through all the actions to illustrate just how he fought off this imaginary demon. When I heard this story there were ten or twelve other men in the cabin and at that time it would not have been safe to dispute the theory of the existence of this demon on the Valdez Glacier, as every man there firmly believed it to be a reality (Abercrombie, page 16, 1899 in US 56th Congress, 1900). There you have it. Thus ended Abercrombie’s interpretation of a miner describing a violent encounter with a Marked Hominid that ended in the death of his son. Let’s hear your thoughts and opinions… Sound off in “comments”! Abercrombie, Capt. W.R. 1900. “Copper River Exploring Expedition, 1898,” in A Compilation of Narratives and Explorations in Alaska, U.S. 56th Cong., 1st sess., S. Doc. 1023 (Washington: 1900), p. 16. Kirtley, B.F. 1964. Unknown Hominids and New World Legends in Western Folklore, Vol. XXIII April 1964, No. 2. Online: http://www.bfro.net/REF/PRECOL/kirtley.html (Accessed 02FEB2016). This entry was posted in 2016 and tagged Glacial Demon, Valdez, Valdez Glacier. Bookmark the permalink. Well I must admit I had not heard that story, very interesting, question is why was it so aggressive towards the son? Also the ending about all those miners believing in it suggests others must have dealt with it before. I wonder if there are other reports from down that way? Yes, why so aggresive? If the father fought with it in order to try to save the son, why is there not more description? Where did it go after the father fought it? Yes, I was kind of disappointed too that there was no follow up after the “fight”. Surely, the “demon” had to go somewhere.